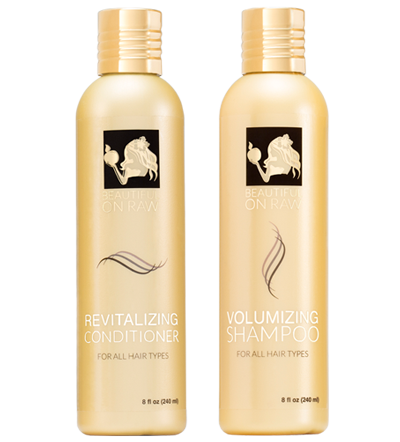 Beautiful on Raw Volumizing Shampoo and Revitalizing Conditioner contain the world’s finest ingredients for healthy, strong, beautiful hair. What we haven't added is important too. Our shampoo and conditioner contain no added fragrances but the smell wonderful due to the harmonious combination of lavender and citrus essential oils. Ingredients: Purified water, sodium coco sulphate, sodium cocoyl isethionate, coco- betaine, cocamide MEA, Guar hydroxypropyltrimonium chloride, glycol distearate, phyllanthus emblica (amla) fruit extract, silybum marianum (milk thistle) extract, brassica juncea (mustard greens) extract, simmondsia chinensis (jojoba) oil, ecliptica alba (Bhringaraj oil), cyperus scariosus (nagarmotha cyperus) oil, brassica nigra (mustard seed) oil, serenoa repens (saw palmetto) fruit extract, aloe barbadensis (aloe vera) leaf extract, butyrospermum parkii (shea butter), olea auropaea (olive) leaf extract, panthenol, tocopheryl acetate, phenoxyethanol, caprylyl glycol, potassium sorbate, vitis vinifera (grape) seed oil, styrax benzoin resin extract, lavandula officinalis (lavender) essential oil, citrus limonum (lemon) essential oil. Ingredients: Purified Water, cetyl alcohol, behentrimonium methosulfate, hydrolyzed wheat protein, hydrolyzed wheat starch, panthenol, phyllanthus emblica (amla) fruit extract, silybum marianum (milk thistle) extract, brassica juncea (mustard greens) extract, simmondsia chinensis (jojoba) Oil, cocos nucifera (coconut) oil, ecliptica alba (Bhringaraj oil), cyperus scariosus (nagarmotha cyperus) oil, brassica nigra (mustard seed) oil, serenoa repens (saw palmetto) fruit extract, aloe barbadensis (aloe vera) leaf extract, butyrospermum parkii (shea butter), olea auropaea (olive) leaf extract, tocopheryl acetate, hydroxyethylcellulose, phenoxyethanol, caprylyl glycol, potassium sorbate, vitis vinifera (grape) seed oil, styrax benzoin resin extract, lavandula officinalis (lavender) essential oil, citrus limonum (lemon) essential oil. Mediterranean milk thistle is related to the daisy family. It is an edible plant which has been used as food as well as an herbal tonic. Milk thistle has gained a lot of attention in the past few years as an aid in maintaining a healthy liver. It has, however, already been in use medicinally for several hundred years, most notably by the Greeks and Romans, not only for liver issues, but also for its protective properties. Today, research is shedding new light on why it is such an effective herbal medicine. Milk thistle extract, made from the plant’s seeds, comprises about 80% silymarin and 20% fatty acids. One of these fatty acids is linoleic acid, shown to help maintain healthy cell membranes and metabolism. The major active constituent of silymatin is the powerful antioxidant silybin. These two substances combine to form a powerful duo that blocks toxins and free radicals from attacking cells. Saw Palmetto, native to North America, grows mainly along the Atlantic coast. It is small and palmlike, producing berries which yield medicinal extracts containing, among many other beneficial properties, several different types of fatty acids and sterols, such as lauric acid, oleic acid, and palmitic acid. Saw Palmetto has been used for centuries in both Europe and North America to promote healthy skin and hair. It has a reputation for preventing baldness due to its deep penetrating action and the fact that the extract prevents the main male hormone testosterone from converting into what is known as Dihydrotestosterone (DHT), the hormone responsible for male pattern baldness. It also prevents the binding of DHT to androgen receptors, thus helping to prevent hair loss. In a recent study, Saw Palmetto was shown to reduce DHT by 32%. You may have heard of Rogaine, the prescription drug routinely recommended by dermatologists to treat hair loss. This is because Rogaine also blocks DHT -but it comes with potential side effects like cardiac lesions, incresed hair loss, facial swelling, nausea, headaches and more. Saw Palmetto does everything Rogaine does, but naturally! Mustard seed oil, used centuries ago by Romans and Greeks, is still used in northern India. Revered as a hair tonic, it stimulates the scalp and promotes hair growth. Lack of selenium and zinc has been linked to hair loss, and mustard seed oil contains high levels of both minerals. It is also rich in the antioxidant beta-carotene and is also a good source of other hair-friendly minerals and Omega-3 fatty acids, essential for healthy hair. In North India, mustard oil is also used for massages. The oil is antibacterial, and massaging with it helps improve circulation and skin texture. Allyl isothiocyanate makes mustard oil an anti-fungal as well. Oleic and linoleic acid make mustard seed oil a great hair stimulator and revitalizer. Its stimulating effects increase blood circulation in the scalp while fatty acids nourish hair roots, strengthening hair and preventing hair loss. Coconut Oil is highly effective at moisturizing the scalp and hair, and offers amazing anti-fungal, anti-oxidant and anti-bacterial properties, thanks to the presence of lauric and caprylic acid. Coconut oil and water are used all over the world to achieve lustrous hair with beautiful sheen. Massaging the head with coconut oil helps eliminate dandruff, especially if used as a pre-wash conditioner. Coconut oil is common in everyday hair care in India, used extensively in hair and skin care products as well as dandruff shampoos. It is an excellent conditioner, valuable in helping to re-grow thin or damaged hair, while delivering essential proteins. According to the Coconut Research Center, coconut oil (taken internally) kills viruses that cause influenza, measles, and herpes, among other diseases. Coconut oil is effective for fungus and yeast conditions such as thrush, diaper rash, and athlete's foot. Bacteria normally present on the skin convert coconut's medium-chain fatty acids into free fatty acids that kill bacteria, viruses and fungi. These free fatty acids also help balance the skin's pH, which in turn repels disease-causing germs. Coconut oil melts at body temperature and will not clog pores. Its smaller molecular structure helps easy absorption and leaves the skin feeling clean - never greasy. What coconut oil does for the skin, of course, it also does for the scalp! While coconut oil forms a protective barrier to hold in moisture, it also penetrates the deeper skin layers, helping keep connective tissues strong and supple, combating damage from excessive sun exposure. To top it off, coconut oil will improve skin texture by aiding in exfoliating of the outer layer. India's 5,000-year-old Ayurveda system of holistic healing is becoming increasingly popular among salons, spas and beauty products manufacturers, due to the effectiveness of the system's skin and hair care principles. Ayurvedic principles are not only effective but natural, and they focus on preventing rather than curing problems. If East Indian women aren't known for their gorgeous hair and skin, I don't know who is. Now some of their secrets can be yours! Amla, also called Indian Gooseberry, is the most widely used herb in Indian Ayurvedic medicine. The amla fruit is famous for having the highest Vitamin C content known - a hundred times more than a grapefruit! This high Vitamin C level makes this berry both an antioxidant and an anti-inflammatory agent. The non-sticky Amla oil, used topically, provides additional nutrition to the scalp and hair, helps prevent hair loss and promotes hair growth. It is safe to use daily to nourish and maintain hair, and does not color, making it safe for any hair. Amla Oil enjoys a prestigious reputation among Asian women because it helps prevent itching and scalp infection, strengthens hair, and prevents premature graying, stimulating hair follicles to produce new hair growth. It's even credited with relieving headaches due to its soothing and emollient properties. The high level of antioxidants it contains helps protect your hair from damage inflicted by free radicals as well as blow-drying and the environment at large. Amla oil is highly favored for its proven ability to increase the thickness of hair. Furthermore, its moisturizing capabilities lock in just the right amount of moisture to keep humidity from flattening out your hairstyle. When you think Amla, think lustrous. Eclipta alba is a powerful rejuvenative tonic which improves hair growth and color. It finds wide use in Ayurvedic medicine for all manner of liver disorders. Commonly called Bhringaraj in India, Eclipta alba and is used in oil preparations (usually also containing Amla, discussed just above) specifically for blackening the hair. The Chinese use it for dyeing hair as well as for its medicinal properties in combating hair loss, eczema, dermatitis, and even as an anti-venom for treatment of snakebites! Studies have shown Eclipta alba to have excellent antifungal properties. Would it surprise you to know that it is the best known herb for preventing balding and prematurely graying hair? Studies performed to determine whether Bhringaraj oil promotes hair growth have yielded promising results. There’s no way I was going to miss out on adding this highly esteemed ingredient to my little bag (or bottle) of tricks! Cyperus scariosus and Cyperus rotundus, commonly referred to as Nagarmotha or nutgrass, are a delicate herbs with aromatic tubers credited with having astringent, diaphoretic and diuretic properties as well as being a rich source of minerals. The oils of these herbs have a neutral waxy consistency and are used as a hair wash in India along with treating hair and scalp disorders. These oils stimulate sebaceous glands near the hair root, where they dilate the small capillary and acts favorably on the sebaceous glands. The extracted oil is widely used medicinally and is even often used in perfumery. A gem for my one-of-a-kind formula! We all know aloe vera is great for treating burns. But aloe acts also as a natural hair conditioner. Aloe helps treat hair loss and aids in maintaining thick, healthy hair, even stimulating new hair growth. Shea butter is a superb emollient. Its unique combination of triglycerides and lipids makes it ideal for skin and hair products. Rich in bio-active ingredients such as lupeol and amyrin cinnamates, it delivers numerous beneficial effects, including anti-irritancy, anti-inflammatory and enhanced UV-B protection. Shea butter is an ideal ingredient in hair products to insure repair and protection. This extract protects hair structure via its conditioning and restructuring effect, creating a lipidic film around the piliferous structure, further adding to the physical protection of your hair. Sodium coco sulfate is a coconut derivative used as a foaming agent in this shampoo. A much safer alternative to SLS or SLES, it avoids the irritation effect of sodium laurel sulfate and doesn’t contain the cancerous byproducts of its cousin, sodium laureth sulfate. Sodium cocoyl isethionate is an ingredient derived from the fatty acid mixture in coconut oil. An exceptionally mild cleansing agent often used in baby products, it cleanses the scalp and hair , helping water mix with oil and grime so they can be rinsed away. The Cosmetic Ingredient Review (CIR) Expert Panel has assessed the safety of this ingredient, concluding it is safe for use in cosmetic products. Coco-betaine is another cleansing agent derived from coconut oil, allowable in organic products certified by Ecocert and BDIH. This ingredient helps the shampoo foam up and maintain its consistency, providing shine preventing static buildup. Cocamide MEA, derived from the fatty acids from coconut oil and monoethanolamine (MEA), increases our shampoo’s foaming capacity and stabilizes the foam. It thickens the shampoo and aids in removing fatty soils from scalp and hair. Derived from the Guar tree, this ingredient is an excellent conditioning agent. Studies done in Europe demonstrate that cationic guars in a shampoo formulation improve the ease of combing in both virgin and bleached hair. Glycol distearate is a white, waxy solid used as a skin-conditioning agent. It helps in increasing our shampoo's viscosity as well as acting as an opacifying agent, reducing the transparent appearance of the shampoo. The Cosmetic Ingredient Review (CIR) Expert Panel has reviewed the safety of glycol distearate, reviewing the scientific data and concluding it is safe as a cosmetic ingredient in the present practices of use and concentration, reaffirming this decision in 2001. Panthenol is derived from Vitamin B5. It binds readily to the hair shaft, enhances the appearance and feel of hair by increasing its body and suppleness, and improves the texture of damaged hair. Panthenol also acts as a lubricant on the scalp surface and ameliorates the hydration and inflammation of the skin. The FDA includes Panthenol on its list of nutrients and dietary supplements “Generally Recognized As Safe” (GRAS). Tocopherol, or vitamin E, is a fat-soluble vitamin and a naturally occurring antioxidant which is isolated from vegetable oil. We have included it in our formulation for its antioxidant and skin conditioning properties. The CIR Expert Panel has determined that tocopherol is safe for use in cosmetics products, finding tocopherol to be neither an irritant nor a sensitizer. In addition, reproductive toxicity and carcingenicity studies were negative. Anti-mutagenic activity attributed to tocopherol was consistent with its antioxidant properties. This is a semi-synthetic preservative used by such companies as Green People and Earth Friendly Baby. Because only a very tiny amount is sufficient, no other preservative can be used in such small amounts. Phenoxyethanol prevents bacteria growth, and so protects the shampoo and conditioner from spoiling. The FDA reviewed the safety of Phenoxyethanol and approved its use as an indirect food additive. The CIR Expert Panel also reviewed the safety of Phenoxyethanol and concluded that phenoxyethanol was safe as a cosmetic ingredient and noted that it was practically nontoxic via oral and dermal administration. The Panel reaffirmed this conclusion in 2007, as part of its scheduled re-evaluation of ingredients. Caprylyl glycol works together with phenoxyethanol (discussed above) to create Optithen, the globally approved liquid preservative system. A true multi-functional ingredient, caprylyl glycol also acts as a wetting agent and provides viscosity modification. Along with broad preservation against bacteria and yeast, the presence of caprylyl glycol gives an exceptionally pleasing feel to our finished formula. Potassium sorbate occurs naturally as para-sorbic acid in berries of the mountain ash tree, Sorbus aucuparia. Potassium sorbate kills microorganisms, specifically mold and other fungi, and prevents or retards their growth and reproduction, allowing our shampoo and conditioner a good long shelf life. FDA reviews of the safety of sorbic acid and potassium sorbate have pronounced them “Generally Recognized As Safe” (GRAS) as preservatives for direct addition to food. Cetyl alcohol and other fatty alcohols keep an emulsion from separating into its oil and liquid components—hence cetyl alcohol’s use by quality companies such as Green People and Earth Friendly Baby. Cetyl alcohol alters the viscosity of my conditioner and stabilizes its foaming action. The Food and Drug Administration (FDA) includes cetyl alcohol on its list of food additives permitted for direct addition to food as multipurpose food additives. Synthetic fatty alcohols are also permitted as indirect food additives as adjuvants and production aids. The safety of cetyl alcohol has been assessed by the CIR Expert Panel, who evaluated the scientific data and affirmed in 2005 that this fatty alcohol was safe for use as a cosmetic ingredient. This ingredient is the mildest detangling ingredient I could find. Derived from canola oil, behentrimonium methosulfate offers outstanding antistatic and detangling ability, while avoiding build-up on the hair. It is particularly mild and often used in baby products which are left on the skin. Behentrimonium methosulfate is superior in effectiveness and mildness to its commonly used cheaper cousin, Behentrimonium chloride. Hydroxyethylcellulose is a gelling and thickening agent derived from cellulose (wood). It promotes better cleaning by forming colloids around dirt particles so they stay suspended in water, facilitating quick, easy flushing away. This extract is a gelling and thickening agent derived from wood cellulose. It acts as a fixative, slowing the dispersion of essential oils into the air. As a result, the wonderful scent of lotus flower lingers alluringly about your hair.